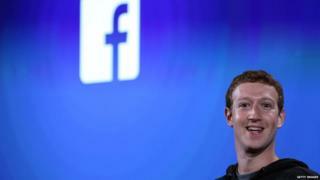 The "milestone" was reached on Monday, when "1 in 7 people on Earth used Facebook to connect with their friends and family", he said in a post. In his post on Thursday, he predicted that Facebook's reach would continue to grow. "This was the first time we reached this milestone, and it's just the beginning of connecting the whole world," Mr Zuckerberg wrote. In July, Facebook claimed that over half of the world's online users visited the site at least once a month. It was only back in October 2012 when Facebook first announced it had one billion users using the site at least once a month - and now, just under three years later, the site has managed to pull in that many in a single day. The question is how can it continue to grow? Surely it will plateau at some point, right? Yes - but we're a long way off that. I've just come back from Facebook's headquarters in California to discuss some of the projects in the pipeline. On the wall, a map of the world highlighted countries with lots of Facebook users. Sure, the US, Europe and India are almost at peak Facebook. But there are huge gaps - Africa, much of Asia, some of Latin America. That's where Facebook is focused on now.